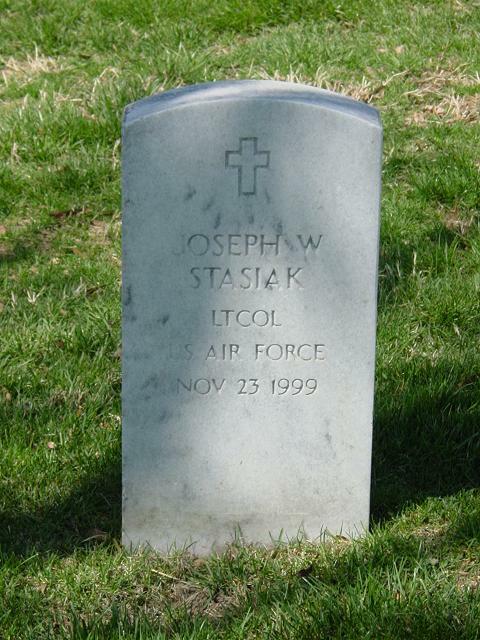 Joseph W. Stasiak, 84, a retired Air Force lieutenant colonel and an ordained deacon who had served as a deacon of St. Michael's Catholic Church in Annandale since 1981, died November 23, 1999 at the Hospice of Northern Virginia after a stroke. He lived in Springfield. He was ordained in 1981 in the Arlington Diocese of the Catholic Church. Colonel Stasiak, who had maintained a home in the Washington area since 1961, was a native of Pittsburgh and graduate of Duquesne University. He began his military career in 1942 when he entered the Army. He served as an infantryman in Europe during World War II. He joined the newly created Air Force and served in accounting and finance posts for much of the rest of his career. Before retiring from active duty, in 1973, he had served tours in Korea and Vietnam. His wife of 43 years, Suzanne, died in 1988. Survivors include a son, the Rev. Kurt W. Stasiak, who resides at the St. Meinrad Archabbey in St. Meinrad, Ind. ; a brother, Edward, of Aexandria; and a sister, Sophie Zalewski of Pittsburgh. On Tuesday, November 23, 1999, at Hospice of Northern Virginia, of Springfield, VA. Beloved husband of the late Suzanne Stasiak; father of Fr. Kurt W. Stasiak, OSB. Also survived by a brother, Edward Stasiak of Alexandria, VA and a sister, Sophie Zalewski of Pittsburgh, PA. Friends will be received on Wednesday, December 1, from 6 to 9 p.m. at St. Michael's Catholic Church, St. Michael's Lane, Annandale, VA, where Mass will be offered on Thursday, December 2 at 12 noon. Interment Arlington National Cemetery. In lieu of flowers, contributions to Hospice of Northern Virginia, Acute Care Unit, 6565 Arlington Blvd., Suite 500, Falls Church, VA 22042.